Sale Price General mills honey nut cheerios 460g, cinnamon toast crunch 360g. Selected varieties.Villaggio Italian Style Bread, Buns or Dempster's Whole Grains Bread 2 $5.00 Sale Price Villaggio italian style bread 600-675g, buns pack 6-8 or dempster's whole grains bread 600g.Black Diamond Cheese or Cheestrings or Galbani Mozzarella $3.77 Sale Price Black diamond cheese 400-450g or cheestrings 336g or galbani mozzarella 500g. Selected varieties.Christie Crackers or Cookies $1.47 Sale Price Selected varieties. 100-454g.Cauliflower $0.97 Sale Price Product of U.S.A. No. 1 grade.Clementines $1.97 Sale Price Product of Morocco. 2 lb bag. Amarylis Bulb Kit 6" Poinsettias $4.88 Sale PriceCoca-Cola, Canada Dry, Pepsi or 7up $6.35 Sale Price 24 x 355 ml. Selected varieties.Jumbo Walnuts $1.97 lb Sale Price Product of U.S.A. $4.34 kg. Clementines $1.97 Sale Price Product of Morocco. 2 lb bag. Selection Dry Roasted Peanuts, Planters Cashews or Almonds $3.88 Sale Price Selection dry roasted peanuts 700 - 800 g, planters cashews or almonds 200 g. Selected varieties.Planters Mixed Nuts or Dry Roasted Peanuts $2.99 Sale Price 300 - 454 g. Selected varieties.Planters Cocktail Peanuts $1.99 Sale Price 300 g. Selected varieties.Russet Potatoes or Carrots or Yelllow Onions $1.27 Sale Price Russet potatoes product of Canada, Canada no. 1 grade, 5 lb bag or carrots or yelllow onions product of Ontario, Canada no. 1 grade, 3 lb bag. Foodland Ontario.Tomatoes on the Vine $1.27 lb Sale Price Product of Ontario. Canada no. 1 grade. $2.80 kg. 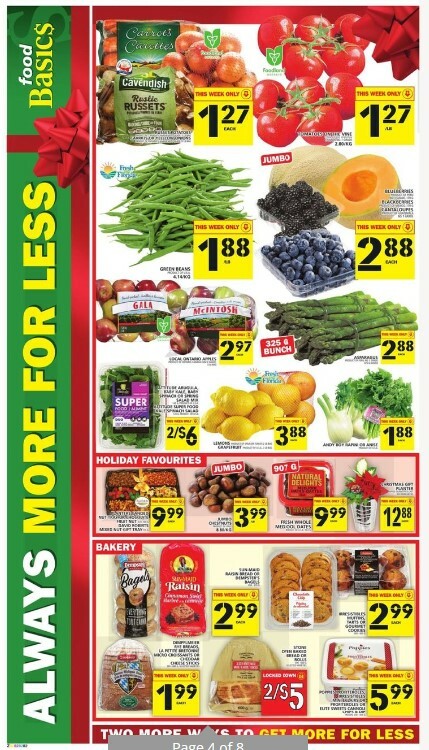 Foodland Ontario.Green Beans $1.88 lb Sale Price Food Basics Weekly flyer Product of U.S.A. $4.14 kg.kberries product of Mexico, 170 g or cantaloupes product of Guatemala no. 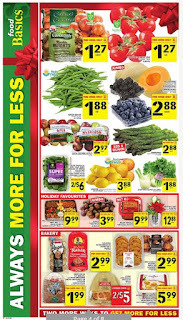 1 grade.Blueberries or Blackberries or Cantaloupes $2.88 Sale Price Blueberries product of Peru no. 1 grade, 170 g or blackberries product of Mexico, 170 g or cantaloupes product of Guatemala no. 1 grade.